I really did not plan to have this as my last post for the year… I wanted to make something more exotic, - something that had a ‘wow’ factor to it. 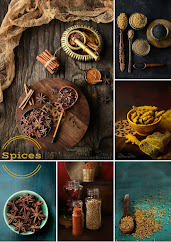 I was browsing through my recipe folder a couple of days ago, to plan the last post. ‘Finally teen’ walked in sneezing and sniffling, (it’s hard to escape the flu at this time of the year); she saw all the recipes, and usually her eyes light up, but this time, she looked at me and asked, “Can you make some pepper rasam for me?” So I made some rasam for her and went back to my quest. 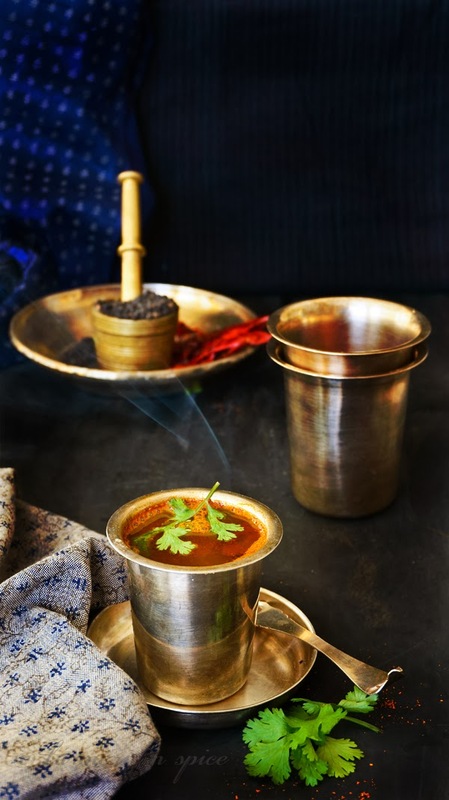 Sipping through the rasam, she asked, “Do you have this on the blog? If not, you should.” I looked at her. 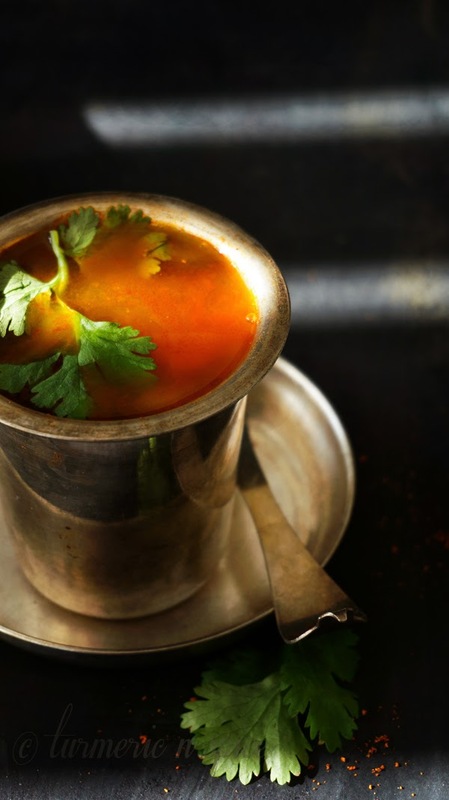 Even if I had made something exotic, she wasn’t going to enjoy it as much as she enjoyed sipping the rasam. Sometimes small pleasures give us so much more. 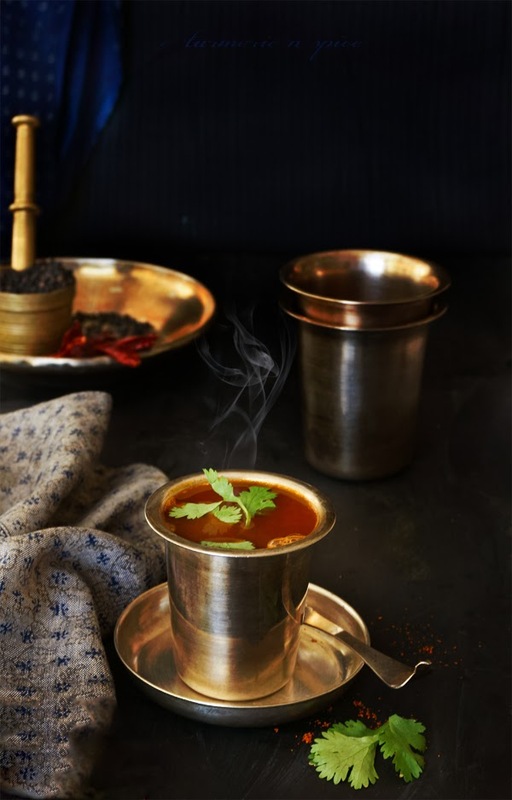 So I went ahead to photograph the rasam… I enjoyed photographing this simple recipe, I’m usually so picky on the way my photographs look, but I felt so good about this one. I don’t know if it is technically perfect, or aesthetically wonderful, but I truly felt fulfilled. I guess that’s what this blog has been for me, very fulfilling. It has helped me open up to understand my strengths, my weakness, made me stronger in my convictions. 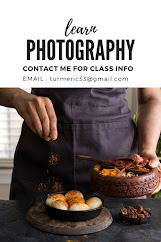 This year has been amazing: I did my first paid photography gig, my first sponsored post by Campbell, and I was featured on The kitchen, Fox news magazine, and The Daily Meal, to name a few. I’m part of some exciting projects in 2014, and I hope it comes through (keeping fingers crossed here). But more than anything, I’m thankful for all the associations I have made through the blog. Thank you guys! Hope you have a wonderful 2014 - Happy New Year to all of you and your family. Spread the love! In a sauce pan heat ghee, add mustard, cumin and let it splatter, add black pepper and asafetida. 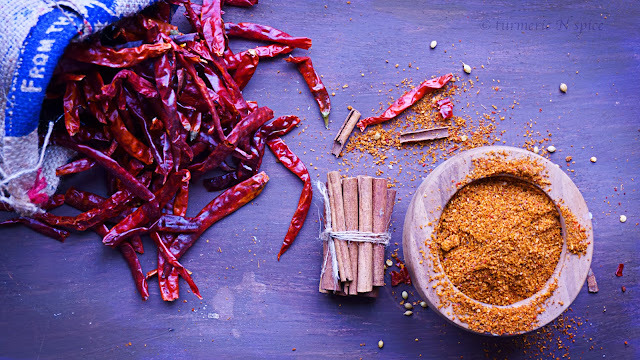 Add 5 cups water, tamarind pulp, jaggery, rasam powder, salt and boil for 8-10 min. garnish with cilantro, wait for the spices to settle to the bottom, serve how with a pinch of ghee. 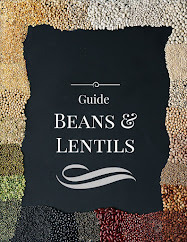 Excellent clear soup for cold and cheats congestion. I really don’t know what is the magic with this rasam but it works wonders when am struggling with a cold. I really need to thank my mother for recipe. Yum! Just what I need! Happy new year and again I tip my hat to your excellent photography. Thanks Deepa, Happy New Year to you and your family. Will touch base with you after the holidays. I think you ended 2013 beautifully with this delicious, homey and comforting soup. 2014 is going to be fabulous! !